The DirectAire 4413 European Curved Recessed Sidewall Vent has an aerodynamic, curved louver blade that directs fresh air along ceiling to the ceiling peak for effective air mixing and speeds air to the center of even wide poultry houses. 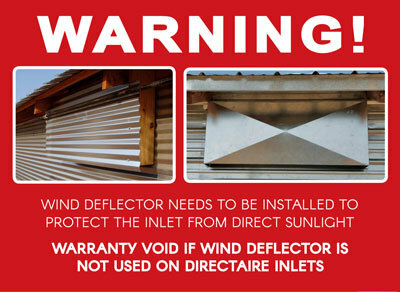 It can maintain a 50% greater air velocity 20 feet from vent than conventional metal vents. The DirectAire 4413 actuated air vent delivers significantly more air (cfm) than conventional metal vents and reduces the number of vents needed overall. Great for reducing or eliminating bird drafting and saving on heating costs, the DirectAire 4413 European Curved Recessed Vent is fully sealed against air leakage and light. 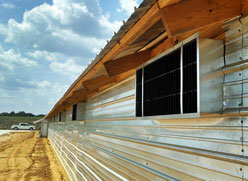 During operation, airflow is directed through vent's top opening rather than leaking out bottom or sides of vent. 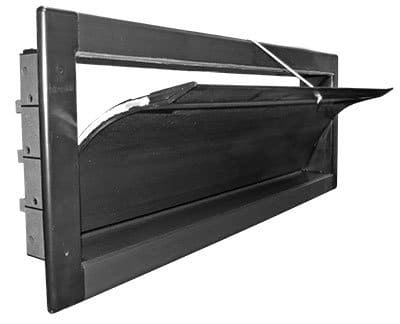 Unlike conventional metal wall inlets, DirectAire Sidewall Inlets have a recessed design that effectively pulls warm air from sidewalls 3 feet away and mixes warm air with fresh incoming air, directing mixed tempered air along ceiling to peak of house. DirectAire Actuated Recessed Sidewall Inlets are available in four different sizes and are rodent and corrosion resistant. 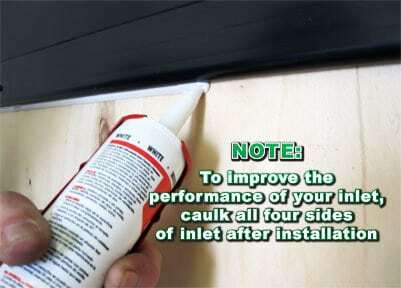 Actual Inlet Size: 44" x 13"
To install shut-off, screw in shut-off just above flange, close to center of sidewall inlet; avoiding pull cable. 15 1/2" x 47 1/4"